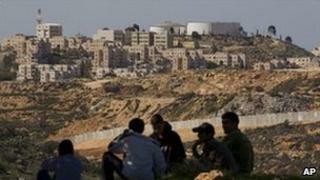 A Palestinian official said the talks process would now be "re-assessed". Washington was under pressure from Israel and Congress, which has a strong pro-Israel lobby, to use its veto. The Obama administration's decision risks angering Arab peoples at a time of mass street protests in the Middle East, the BBC's Barbara Plett reports from the UN. It had placed enormous pressure on the Palestinians to withdraw the resolution and accept alternatives, but these were ultimately rejected. On paper this was a defeat for the Palestinians but they and representatives of other Arab nations seemed to be in a buoyant mood. They had held out some hope that America would abstain, but not much, so the veto was predictable. The degree of support, on the other hand, was overwhelming: some 130 countries co-sponsored the resolution, and all the other members of the Security Council voted for it. The result was strong endorsement of the Palestinian position on Israeli settlements - that they are illegal, and an obstacle to peace - which isolated Israel. It also isolated the United States. No matter what reasons America gave for the veto (it insisted bringing the matter to the Security Council complicated chances for peace talks) or how fulsomely it criticised settlement building (as a folly and threat to peace) it appeared out of sync with the international consensus, and as Israel's only defender. Given the ferment in the Arab world at the moment, that is not a good position for Washington to be in. While stating that it opposed new settlements, the Obama administration argued that taking the issue to the UN would only complicate efforts to resume stalled negotiations between Israel and the Palestinians on a two-state peace deal. "Unfortunately, this draft resolution risks hardening the positions of both sides," said the US ambassador to the UN, Susan Rice. The resolution, sponsored by at least 130 countries, declared Israeli settlements in Palestinian territories were illegal and a "major obstacle to the achievement of a just, lasting and comprehensive peace". Speaking from Ramallah in the West Bank, PLO secretary general Yasser Abed Rabbo said the US veto was "unfortunate" and "affected the credibility of the US administration". Israeli Prime Minister Benjamin Netanyahu welcomed the US veto, adding that his country remained committed to "a solution that will reconcile the Palestinians' legitimate aspirations for statehood with Israel's need for security and recognition". Britain, which voted in favour of the resolution, called on Israel and the Palestinians to resume talks because of the gravity of the stalemate between the two sides. Referring to recent events in Egypt and other Arab states, Foreign Secretary William Hague said the parties involved should not be "diverted by events in the wider region from working towards a just and lasting resolution to the Israeli-Palestinian conflict". "I call on both parties to return as soon as possible to direct negotiations towards a two-state solution, on the basis of clear parameters," he added.